Canadian filmmaker Allan King died in the summer of 2009 at the age of 79. Fortunately, he left behind over 50 years worth of films that will remain with anyone who sees them for the rest of their lives. While he directed his share of fictional movies and television, King is best known as a documentarian. He even pioneered a vйritй documentary film movement that is now known as Direct Cinema, despite King, himself, consistently referring to these films as “actuality dramas.” Unfortunately, most of these films have been virtually unattainable from anywhere other than from King personally, until now, as The Criterion Collection brings us five of them in a nice box set titled The Actuality Dramas of Allan King (Eclipse Series 24). These startlingly intimate studies of lives in flux — emotionally troubled children, warring spouses, and the terminally ill — are riveting, at times emotionally overwhelming, and always depicted without narration or interviews. Humane, cathartic, and important, Allan King’s spontaneous portraits of the everyday demand to be seen. 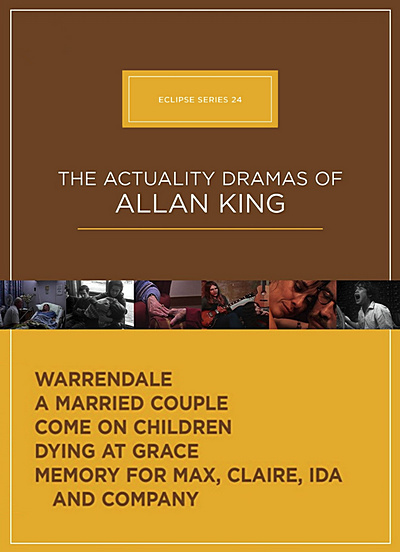 1967's Warrendale, the only entry in B&W, is King's most celebrated show. King filmed in an experimental home for disturbed children, following the residents of a living unit from dawn until lights out. 1969's A Married Couple shows the limitations of the documentary form. King knew his film subjects, who were amenable to having their marriage transformed into another unblinking actuality show. Nonconformists Billy and Antoinette Edwards also show themselves to be prime exhibitionists, and seem eager to externalize their marital tensions for posterity. 1972's Come On Children, a topical look at teenage alienation that sounds identical to a Reality Show. King interviewed disaffected teenagers and selected a group that wanted to get away from adult influence -- school, church, parents. The movie grants them that wish for ten weeks of filmed residence at a remote farm. The last two films in the series are masterpieces of filmmaking. After thirty years away from Actuality Dramas Allan King returned in 2003 with Dying at Grace, a penetrating look at a universal issue. Five terminal patients authorized the filming of their final months of life at Toronto's Grace Health Centre, and King dutifully recorded everything on Digital Video. A natural process previously observed only by hospital staff and other professionals is revealed in 148 gripping minutes. The final film is 2005's Memory: for Max, Claire, Ida and Company. The subject is a nursing home specializing in patients suffering from memory loss and dementia. The cross section of old men and ladies in various stages of disorientation is fascinating: some seem simply unaware of the passage of time while others have difficulty recognizing loved ones.